Thanksgiving stuffing can be a holiday lightening rod. I've seen family members almost come to blows over their personal stuffing preferences. Take our family, for example. When I met my future husband and we began merging our Thanksgiving traditions, stuffing became a major debate. As our first holiday feast approached and I helped plan the menu it quickly became apparent that my stuffing might make or break my future in-laws opinion of me. That was my admittedly insane thought as I sat in my kitchen drawing up the shopping list with Vivien, my MIL-to be, but I don't feel like I'm the only woman out there who has strapped on her crazy pants while coming up with their families holiday menu. While I spent our first few holidays making my mother's preferred cornbread stuffing, I ultimately switched over to Vivien's favorite version, made with brioche, when it was clear I was never going to win her over with mine. I have to admit that Vivien did open my eyes to how good something new can be. Brioche stuffing is pretty incredible and it vanishes pretty quickly off of our table. My kids are less discerning when it comes to stuffing. Cornbread or brioche, they will eat pretty much anything made with bread. 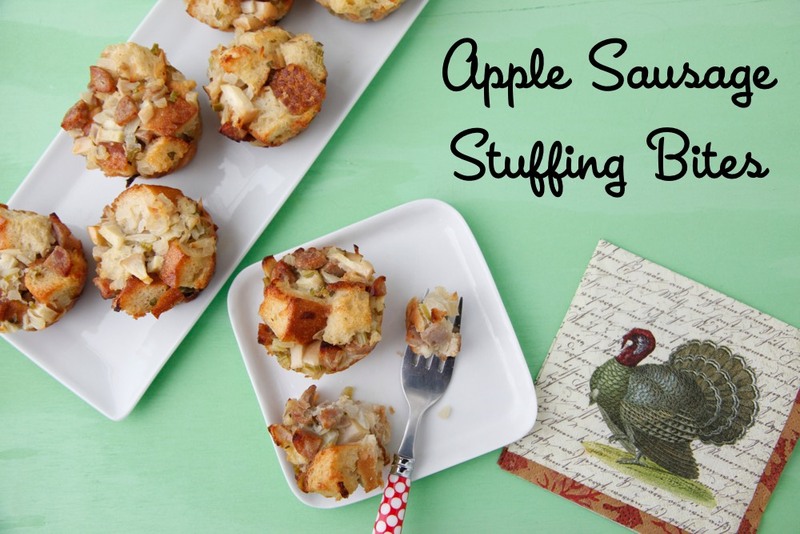 However this year I'm starting my own tradition by making these Apple Sausage Stuffing Bites. Besides being so darn cute as well as personal sized so everybody can have one for themselves, they combine traditional stuffing flavors like celery and onions with two of my kids' favorites, pieces of sweet apple and chicken apple sausage. Because of these bites' small size, they get golden crispy around the edges in the oven and are perfect for little hands to dip into warm gravy. 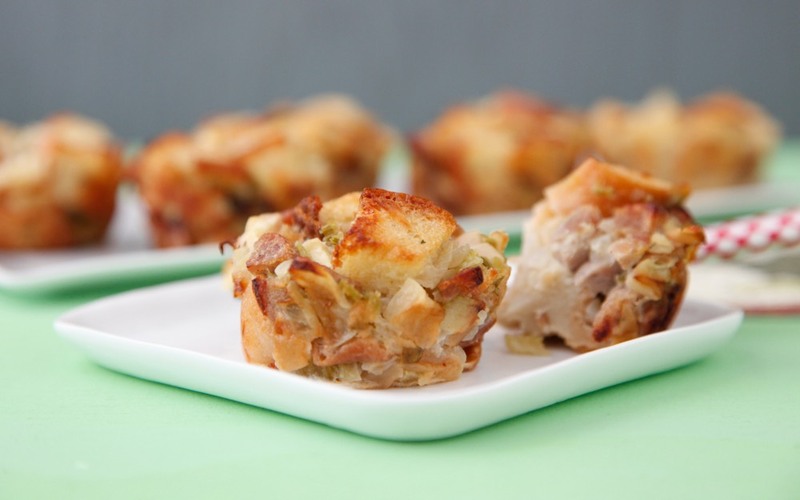 I know changing your stuffing can require a big leap of faith and might have the whole family up in arms, but once they taste these how scrumptious these special holiday bites are, I bet they will be fighting over who gets the last one! 2. Toast the bread cubes for 8-10 minutes to dry them out. Alternatively, you can use day old bread that is already dried out. 3. Increase oven temperature to 350F. 4. Heat oil in a sauté pan. Add the sausage, apples, onions and celery, and sauté for 5-7 minutes, until everything is heated through and the veggies are tender*. Allow to cool a few minutes before continuing. 5. Place all the ingredients in a large bowl and toss to thoroughly combine. 6. Spoon the stuffing mixture into greased muffin tins, filling all the way to the top. Pat the mixture down to pack it well. *Note: If you’re using sausage that is not fully cooked, sauté it for 4 minutes before adding the oil and the remaining ingredients. Do you have any recommendations for what I can use to replace the egg in this recipe? My son has an allergy. The egg helps hold everything together! I haven't tested it in this recipe, but I think your best bet would be a flax egg. 1 tablespoon ground flax plus 3 tablespoons water, stir together and let sit a few minutes before using! Love this recipe! I think I will make these to bring as appetizers on Thanksgiving. Love your site. Can you suggest a brand of sweet apple sausage links you use? Do you use chicken sausage, like Applegate Farms? I haven't tried this recipe but it looks great and I'm sure my kids will love it. In similar recipes I use the Applegate Farms Chicken Sausage with Apple. I've tried other brands and that one has the best flavor (to me). If these were made a day in advance how would they hold up? They hold up great! Refrigerate, and when ready to serve, warm them in the oven or in the microwave! This recipe is almost exactly like ours -- we make stuffin' muffins and stuff the bird... Best of both worlds! I certainly put my \"crazy pants\" on every year- funny! I feel like this is a great option for my daughter Pia especially- we could make hers with gluten free bread and they would be the perfect size! yum, is it wrong that I want to eat a half dozen of these right now (before bed!). And I especially love that while I'm reading, I can see you making homemade playdough with Kenya in the vid to the right. Love that even with the sound off (baby sleeping), I can hear your beautiful laugh. :) Darling! I think I could skip the turkey and go straight to these bites, Catherine! Can't wait to try them. Stuffing is, without a doubt, my favorite part of the Thanksgiving feast and I always insist on making my dad's recipe. That being said, these little bites look like so much fun! These sound amazing! Are they made in traditional or mini muffin pans? Aldo, does weelicious have an app? I made these in regular muffin pans! I've learned the same about families and their stuffing! My Italian family made stuffing with pasta in it (and I still make it every year) so I really didn't experience traditional stuffing of any kind until I met my husband's family :) I always bring my stuffing as something different to contribute to where ever we are having Thanksgiving - it's so hard to give up family tradition! Forget Thanksgiving, I'm making these tomorrow. They are so adorable, I know my kiddos would love them! I haven't tried freezing them, but I'm sure that would work! But, what would you suggest to replace the sausage if I was going for a vegetarian option? You can leave it out, or use something hearty like mushrooms! I made these for my daughters school potluck but they seemed a little dry. Do I need to add an egg or add fewer bread cubes? I love the idea of these and yours look so pretty. I can't wait to try these! Getting recipe ideas for a Christmas party- will be seeing my Dad for the first time in years. So excited to have these on the menu. Thanks Catherine! You always save the day. How long would you bake these for if you made them in a mini muffin pan? They would still take the same amount of time to bake because the time in the oven helps them sort of stick together. I wouldn't suggest a mini muffin pan though, because I don't think you will be able to get enough of each element in this little cups for these to really come together! I want to bring these to a Christmas eve dinner and for a Christmas day dinner. I'm not sure how to plan the baking. Should I bake fully day before and then just heat up in oven before serving or should I place mixture in muffin tin, refrigerate and wait to bake them the 45 min when I get to the houses I'm going to? Thank you for your recipes and your help!